Once again, the holiday season is upon us. As always, this is an exciting time of year for customers and retailers alike. And what would the holidays be if not for the gift wrap in which retailers package their wares? They’d look very different indeed. 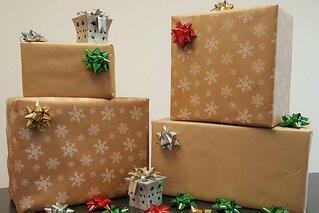 Mastering the art of holiday wrap can be challenging and costly. If you’re a retailer then you know how competitive the market can be this time of year. Upping your holiday wrap game can make you more competitive and help you stand out among a sea of retailers this season. As a retailer, you could learn a lot from popular arts and crafts supplier Michaels. The store is a go-to for all of the crafts that are trendy year ‘round — and holiday gift wrap is no exception. So, how have they mastered the art of gift wrap, and how can you follow suit? Michaels recognized the trend and popularity of wrapping gifts with kraft paper many years ago. Kraft paper is a more affordable alternative to other wrapping options and Michaels first began using it to wrap finished products in its custom picture framing department. Then, six months later, its dedicated framing offshoot, Aaron Brothers, followed suit. Today, Oren International supplies kraft paper to 120 Michaels stores nationwide. As Oren’s reputation for supplying affordable, high-quality kraft paper grew throughout the organization, and customers became more intrigued by the idea of wrapping gifts with kraft paper, Michael’s contacted Oren to help out with the creation of a holiday-themed kraft paper gift wrap. As a paper supplier and flexographic printer, Oren was able to work with the retailer to deliver a design with white snowflakes printed on high-quality brown kraft paper. Now, Oren delivers 5,600 rolls each holiday season, which is enough paper to wrap approximately 560,000 individual framed pieces. Disney is another retailer that’s capitalized on the printed kraft paper trend for packaging. In its case, it uses light weight bleached kraft paper, flood coated with blue ink and with white Disney characters reversed out to fill gift boxes shipped to customers. No matter what time of year, or whether your goods are sold in a brick-and-mortar store or online, kraft paper can be a great packaging and wrapping addition to help your business stand out. If huge retailers like Michaels and Disney have benefitted from this trend, imagine what it can do for you. What difference could a small detail like this make in your retail store this holiday season? There’s no doubt custom-printed kraft paper can make a huge impact, and it’s very simple for even small retailers to mimic this holiday trend. With a little effort and creativity, you can make a brand statement to stand out above the competition. Flexographic, or “flexo” printing, is a simple, effective and affordable solution that uses a modern version of the letterpress to print on paper and other materials. Flexo inks have a low viscosity for quicker drying time and speedier production and lower costs. And you don’t have to order your printed kraft paper in huge quantities like a large retailer in order to realize a cost savings. Whether you’re ordering 10 rolls, 500 rolls, or 5,000 rolls of printed kraft paper, Oren treats every order with the same level of care and attention. No matter what, you‘ll get high-quality flexo printing on high-quality kraft paper that your customers will love. If you’d like to talk to Oren about your holiday wrap options, contact us today! © 2018 Oren International. All rights reserved.